Notice the TinkerTry tagline, above. The words home and backup. They're an integral part of my 2 decade IT career, and a common theme among the 500+ posts here at TinkerTry.com. I'm always investigating various ways to backup all of my home lab PCs, servers and VMs. Simply, and easily. that's currently available in beta form, I took notice. Not because of the Surface Pro 3 incentives for beta testers, but because backup and bare-metal restores have always interested me, since I don't particularly enjoy setting up a system all over again, once the PC and/or hard drive inevitably fails. Let's think about Veeam's use of the word "endpoints." That's those vulnerable laptops and desktops at family member's homes that have become an integral part of many an IT Pro's holiday visit experience. I genuinely like helping people, but would rather avoid spending excessive time doing so. Wouldn't it be nifty if those daily backups worked without intervention, and used the same backup repository that your VMs are using, back at your home virtualization lab? Or even just a backups to a network share there. This off-site "personal-cloud" storage allows easy and quick restores, especially if the family member lives close enough. Who knows, maybe we'll get VPNs injected onto those restore media someday, allowing full bare-metal restores, back to the time when that the PC worked. Admittedly, this would require a beefy internet connection at both ends, something I'm lucky to now have. Superguide: Home virtualization lab backup software, some special deals for VMware VCPs and vExperts. The unique part of Veeam's Endpoint Backup FREE software is that it's filling the need for simplicity, trying to help that person avoid cluttering their already busy evenings and weekends with yet more work. The potential to give back more time to tinker and learn, back in the home lab. Take a step back for a moment, and imagine using an affordable VMFS formatted datastore for your family's needs, such as the eSATA RAID enclosure I've been using for years now, handling that daily backup repository just fine. Perhaps you'd like to simplify even further while also bringing the costs down, such as VMFS formatting an internal 3.5" drive, like the very recently announced behemoth, Seagate’s first shingled hard drives now shipping: 8TB for just $260. In my family, I have 12 physical and 3 virtual systems that are backed up daily, many of them over VPN. Windows Server 2012 R2 Essentials has been working fairly well for my family for 8 years now, with a single-instance-datastore that's still about 5TB in size. I'd rather have something more affordable that's faster at bare-metal restores, and free. With WS2012R2E, restores take overnight. Even better if something new is also easier to install/use/maintain. Oh yeah, and free. What would it actually cost me, a vExpert and VCP5-DCV, to keep the repository product running in my home lab, which is Veeam Backup & Recovery v8? That centralized repository would hold both my VM backups, and my friends and family PC backups. Well, the pricing is for the enterprise, naturally. That's what I call a showstopper, for the home lab. 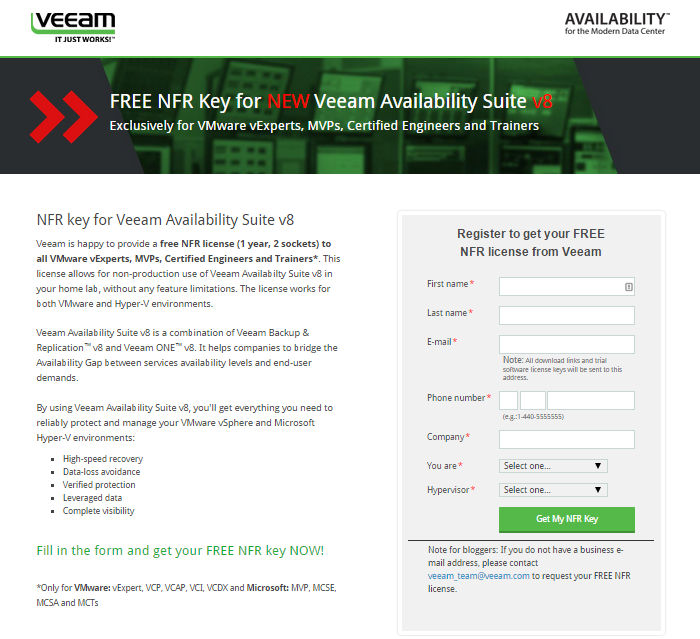 I'm happy to announce that as of today, Veeam's NFR key sign-up is ready. If you're a vExpert, VCP, VCAP, VCI, VCDX, and/or a Microsoft MVP, MCSE, MCSA, MCT, you may be eligible, for 1 year / 2 sockets. Now we all wait and see what happens next with those requests...then the real testing can begin for my VMs. Other physical PC backups will have to wait until a later Endpoint build that allows me to point to that same B&R repository as the backup target. I have not made up my mind yet, about what I'll be using for my home lab in 2015 and beyond. But at least I now have some time to make that informed decision. Disclosure: Veeam products featured above are not affiliate links, so there's no commision for TinkerTry.com, LLC. 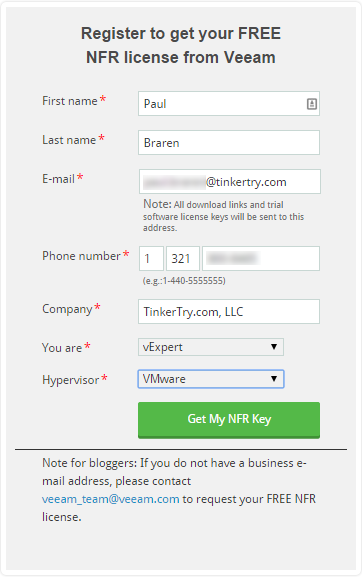 While Veeam is an occasional advertiser on TinkerTry.com, their advertisement department is not sponsoring this post. None of my posts are sponsored.